Resealable pack for continued use. 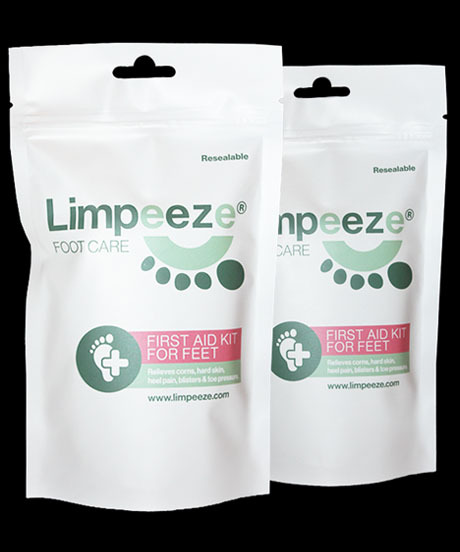 Free delivery when you purchase 3 or more packs! Runners, Walkers, Cyclists, Joggers, Hikers, Bikers, Tennis, Skateboarding, Basketball, Climbing, Judo, Cleudo, Boxing, Dressage, Eventing, Angling, Dodgeball, Football, Golf, Kitesurfing, Hockey, Ice Hockey, Sailing, Skiing, Squash, Polo, Rowing, Weightlifting, Ice Skating, Paint Balling, MOD, National Trust, Train Stations, Bus Stations, Airports, Walking Groups, Rugby Clubs, Golf Clubs, Football Clubs, Motorbike Racing Clubs, Gp Packs For Patients, Festivals, Shows, Concerts, Sponsored Walks, Fun Runs, Marathons, Holiday Makers, City Breaks, Hairdressers and People Working On Their Feet All Day. 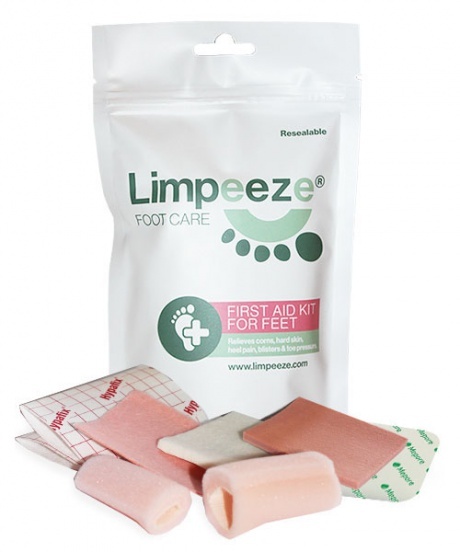 2 Toefoams for Rubbing & Toe Pressure, White Felt for Pressure Deflection, Pink Foam for Shock Absorption, Pink Felt (Thin) for Friction & Rubbing Areas, plus Hypoallergenic Adhesive Tape and 2 Sterile Adhesive Island Dressings. COPYRIGHT © 2018 LIMPEEZE. ALL RIGHT RESERVED.